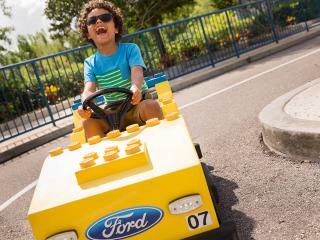 The LEGOLAND® Florida Resort One Day Ticket gives you a full day's admission to the park and tickets are open-dated so you can visit LEGOLAND® Florida Resort at any time during your holiday when the park is open. The ticket does not include admission to the LEGOLAND Water Park. Project X - Brave guests feel the power of acceleration, braking and manoeuvrability, as they race a life size LEGO® Technic™vehicle along a wild roller coaster track. DUPLO® Valley - The place where little ones can explore the countryside on the DUPLO Train, find the missing farm animals on the DUPLO Tractor ride, cool off in the DUPLO Splash and Play area or build in the Tot Spot play area. The Dragon Coaster - An indoor/outdoor steel roller coaster that features a hilarious behind the scenes view of life within the enchanted castle. LEGO® MOVIE™ 4D A New Adventure - Join your favourite LEGO® MOVIE™ characters in an exciting new plot. With some of the original voices from the film mixed with 4D effects, you can look forward to an awesome adventure. MINILAND USA - Where else can you see California, Las Vegas, Washington DC and New York City all in one day? MINILAND USA contains over 32 million LEGO® bricks and amazing scenes from coast to coast all the way to a galaxy far, far away!